Pata negra ham and traditional food from Spain in My Jamon shopping. Weight: 7.5 kg - 8 kg. Seasoned for more than 30 months. Melgar's Iberian ham comes from pigs raised in Arriate, in the Serrania of Ronda, an area of great production of Iberian pigs for different Spanish brands. This ham is cured, bred and seasoned with such care that you always have a fine result. Each piece offers a range of white veins sign of good seasoning and that'is sign that the pig has been feeded in large part by acorns during grazing and lived in total wild. 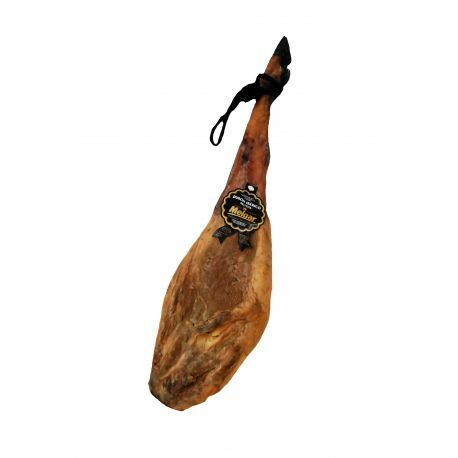 Unlike the Iberian ham with designation of origin, seasoning matches more than 30 months.